14 Watt G25 Globe With Armor Coat 4G2514A41K Cool White CFL - Initial Lumens - 750: Lamp Wattage - 14 Watt(s): Average Lamp Life - 8000 Hours: Base Type - Standard Medium / E26: CCT (Kelvin) - 4100: CRI - 82: Length - 4.40 Inches: Diameter - 3.10 Inches Get the look of a standard incandescent globe light bulb with the energy savings of a CFL. The TCP 14-watt G25 Globe InstaBright CFL light bulb (4G2514A41k) is ideal for use in table lamps, ceiling fixtures, ceiling fans, as well as indoor/outdoor fixtures. Patented G2 technology uses amalgam mercury to provide full brightness in seconds. The light bulbs are cool / bright white 4100K. Light bulb has a rated lamp life of 8,000 hours Armor coating prevents the bulb from shattering when broken. Use in food preparation areas and where children and pets play. Non-dimmable. 14 Watt = 60 Watt incandescent. 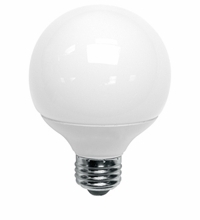 Get the look of a standard incandescent globe light bulb with the energy savings of a CFL. Armor coating prevents the bulb from shattering when broken. Use in food preparation areas and where children and pets play. Non-dimmable. 14 Watt = 60 Watt incandescent.